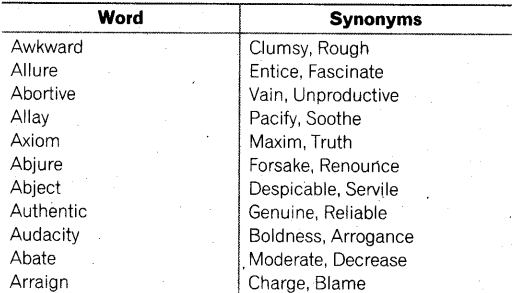 Questions based on Synonyms are usually of two types. In the first type, four alternatives are suggested for a given word. 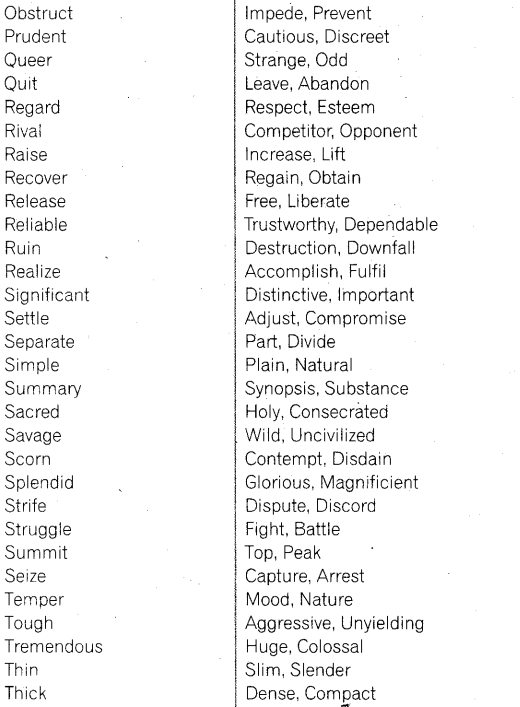 You have to choose the alternative which best expresses the meaning of the given word. In the questions of second type, a sentence is given with a word printed in bold, italics or underlined. Below the sentence, four alternatives are suggested for this word. You have to choose the alternative which is similar in meaning to that word in the sentence. 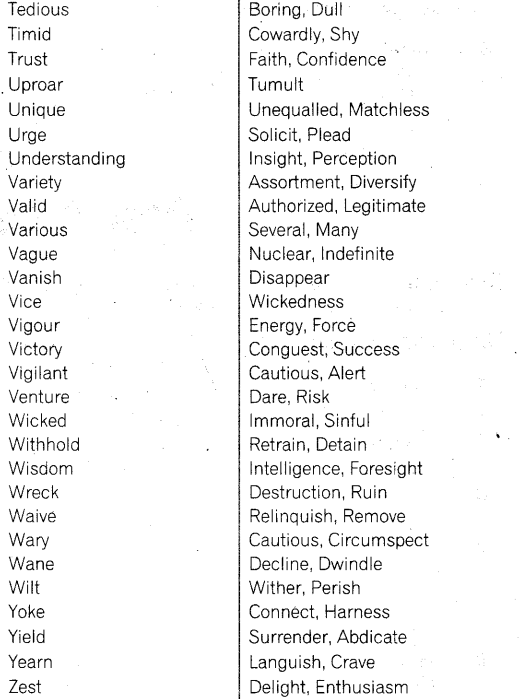 (a) Wise- its synonyms are prudent, learned, well-read etc. (b) Wrong- its synonyms are erroneous, incorrect, inaccurate etc. 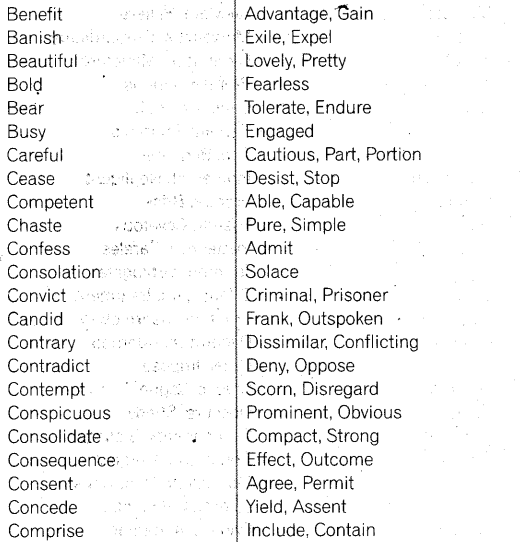 Choose the synonym according to the meaning of the given word as used in the Sentence. If you donot understand the given word, you can sense its meaning from the context. 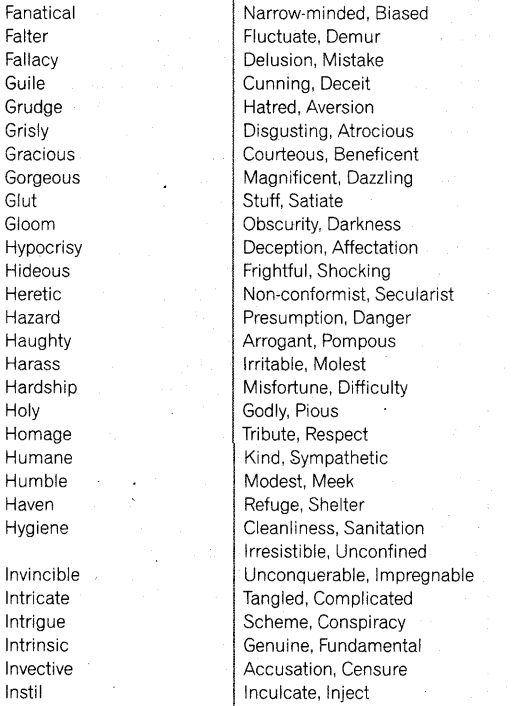 Be careful not choose the obvious synonym of the word. You have to choose according to the meaning in the passage. Select the answer of the same form or class (noun, verb, adjective etc.) as the given word. Eliminating the wrong options can also lead you to the right answer. Answer. 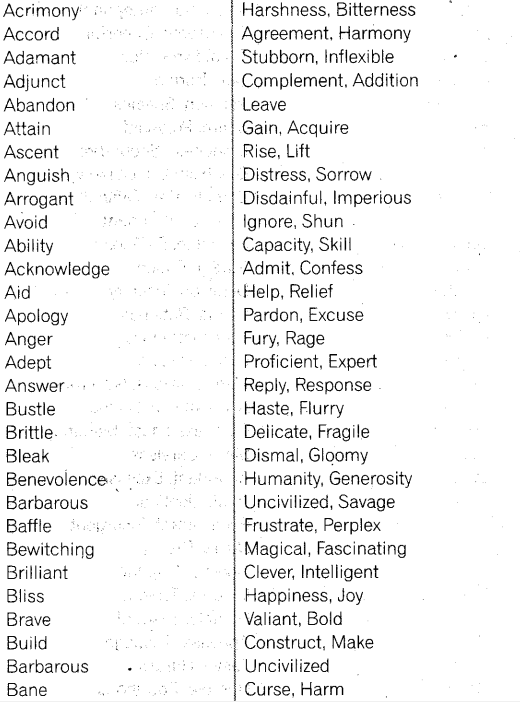 (b) ‘Digress’ and ‘meander’ both mean “to change subject often while talking that makes it difficult to understand”. Answer. (b) Jealous means ‘feeling angry or unhappy because you wish you had something that somebody else has’. Answer. (c) Quest means ‘to search something’. Answer. (b) Spurious means ‘false, although seeming to be true’. Answer. 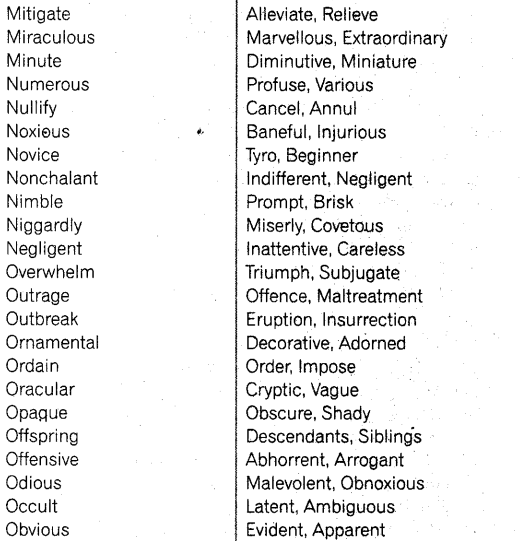 (c) Latent means ‘existing but not ver’ noticeable’. Directions (Q.Nos. 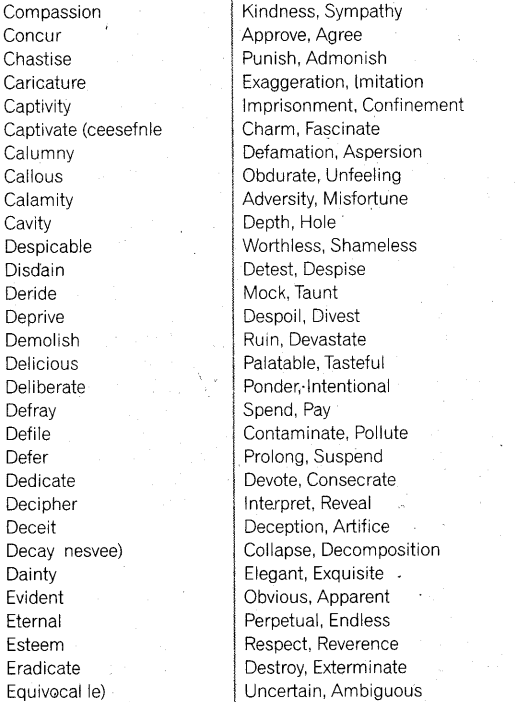 1-30) In each of the questions below, choose the alternative which is most nearly the same in meaning to the given word. mendicam living by asking people for money and food’. Instinctive means ‘based on instinct not thought or training’. Clone means’an exact copy of something’. Anguish means ‘severe pain or mental suffering’. Fortitude means ‘courage’ shown by somebody who is facing great difficulties. 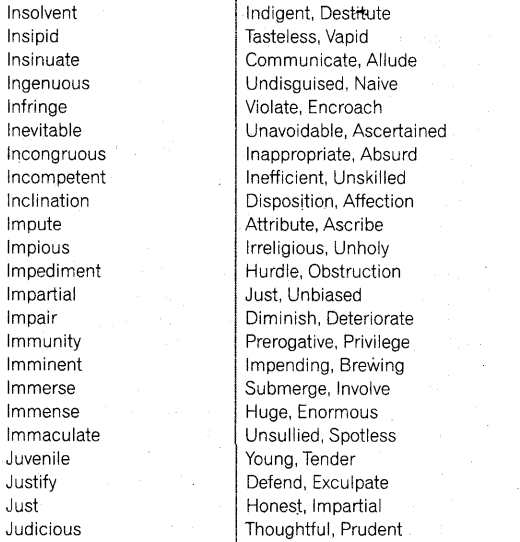 Imply and connote both means ‘to suggest’. Vigilant means ‘very careful to notice any signs of danger or trouble’. Directions (Q.Nos. 1-11) In the following sentences, a word or phrase is written in italicised letters. 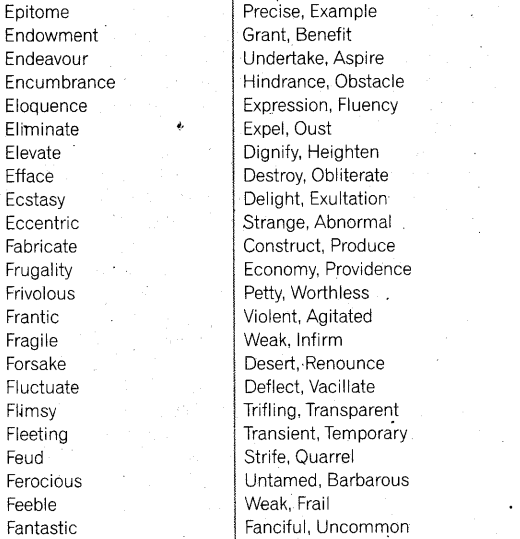 For each italicised part, four words are listed below each sentence. 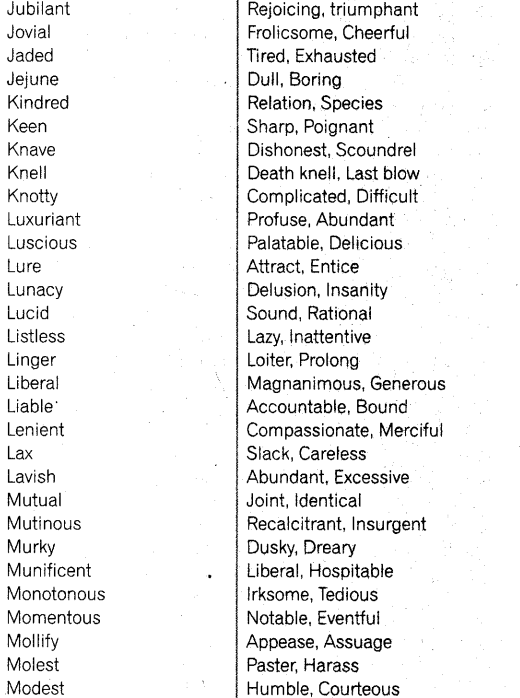 Choose the word nearest in meaning to the italicised part. 5. The boy gave a vivid description of all that happened. 6. It is compulsory for all the students to join this tour. 7. Some of the discoveries of modem science are simply marvellous. 8. The teacher felt that the student lacked discrimination in the study of his data. 9. We don’t know how we are to recompense you for the trouble you have taken. 10. John Milton wrote “Paradise Lost’ to vindicate the ways of God to man. 11. We should always try to maintain and promote communal amity.